for Storing Inflatable Boats, Inflatable RIBs, Hard Shell Dinghies, Kayaks, Canoes, ski tube towables, and more on Powerboats and Sailboats, and cargo too! 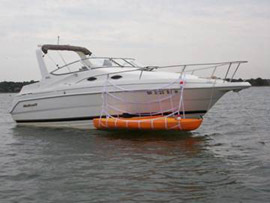 This is the simplest, most universal, and most cost effective dinghy davit system on the market. If you need a basic and flexible dinghy davit system and don't want to invest in a more permanent and sophisticated system - this is the answer for you! See "Photos" tab above for many customer photos and testimonials. This the simplest, most universal, and most cost effective davit system on the market. If you need a basic and flexible davit system and don't want to invest in a more permanent and sophisticated system - this is the answer for you! Now you can take inflatable boats, inflatable Rib, row boat, canoe, kayaks, ski tube towables on your cruise securely without spending several hundreds or even thousands of dollars on a davit system - and you won't lose precious swim platform, deck or bow space. Unlike most other davit systems, with the Dinghy Sling you don't have to glue parts on your dinghy, and in this case you won't have to drill holes in your vessel either. 360 degree integrated floatations and long straps for larger vessels to allow the sling to help keep it's shape during deployment, resist floating under your vessel, and ability to use on wider beams where cleats or rails are not close to Dinghy. Strong, portable, lightweight, UV resistant with all marine grade materials and strongest attachment buckles available. Easy lifting and lowering with quick deployment for emergency situations. Can be stored straight up or at any angle - you choose so as not to block view. 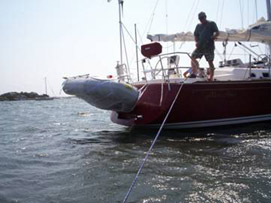 Can prevent man overboard situations where the dinghy could catch you. Works on sailboats and power boats with or without a swim platform and even off the sides of docks to keep walkway clear. 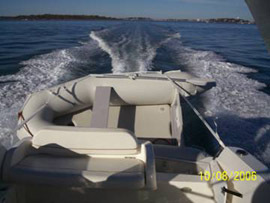 Will carry kayaks, row boats, canoes, inflatable boats, RIBs, ski tube towables, cargo and more. Sling davit connects to your larger vessel using long support straps and quick snap buckles. No drilling, bolting, gluing or modifications to your boat or dinghy. No more fiberglass chips and cracks! 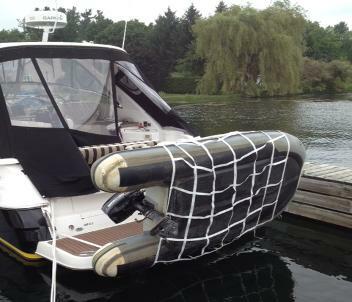 Keeps your tender out of the water to prevent algae growth and drag on vessel. 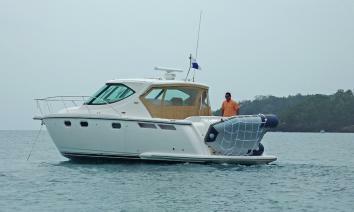 Helps in maneuvering in tight harbors where towing would not be possible. Helps reduce chance of theft of dinghy or kayak while up in sling. 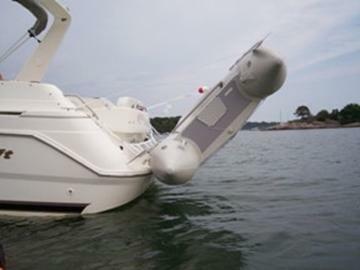 Testing has shown reduced engine exhaust noise on deck and keeps you drier from splashing in following seas since inflatable rests against transom. Easily operated with only 1 person. Feel secure knowing your dinghy is right behind you ready to deploy in a moments notice. Comes with a handy storage bag for tidy storage of sling when not in use. Fits perfect on Cruisers, Back Cove, Searay, Formula, trawlers, catamaran and many other power boats and sailboats with inboard or inboard / outboard engines. 6’ wide x 7’ long sling system. Rated for dinghies up to 200 lbs. and 11’ long. Want to leave your engine on your dinghy? See information below. High strength, stiff webbing material made specifically for our product. 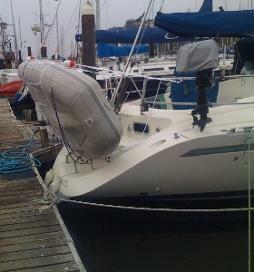 Will fit most dinghies and attached to most larger vessels - powerboats, sailboats, etc.boats. 5 year warranty - Free replacement or repair. 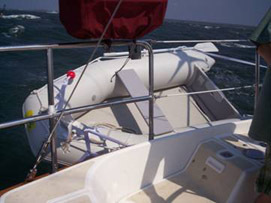 Long loop straps with high strength acetal buckles sewn in connect the sling davit to rails or cleats on your larger vessel. Easily operated with only 1 person. Dinghy Sling system comes with all specially designed adjustable straps so you can adjust your Dinghy to any height or angle you wish. Connects to cleats, railings, or stations that already exist on your larger vessel. Also comes with a storage sling bag when not in use. The Dinghy Sling is not a cargo net you buy in a store! 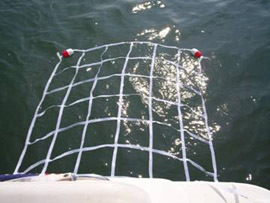 This sling is specifically designed to stretch in the middle to conform and hold boat tightly. Sides of sling and straps are stretch resistant and very strong so as to hold the weight of the boat safely and securely. This product will not sink like other marine sling products. It has built in floats to keep it afloat. Read more usage information on the USAGE INFO tab above. Your item will be shipped next business day after payment is received. 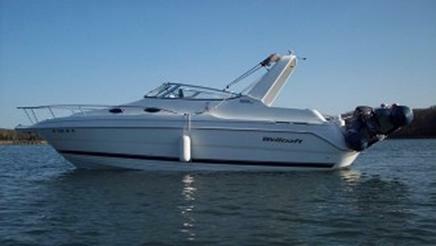 Can I Leave My Engine on my Dinghy when using the Dinghy Sing? 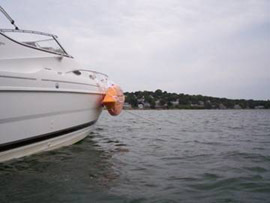 Total weight of dinghy, engine, gas tank, etc, cannot exceed sling maximum weight rating of 200 lbs. We recommend only 2 stroke engines under 8 HP, and not 4 stroke engines unless you plan to leave the dinghy in the horizontal or flat position. When 4 stroke engines are tilted sideways, they can allow gas to run into the crankcase, which is bad for the engine. 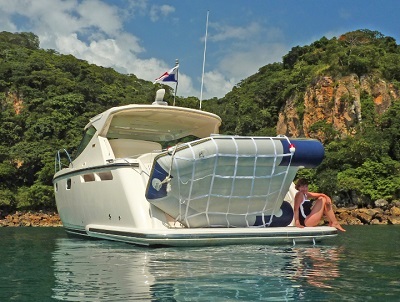 We recommend removing the fuel tank unless you plan to leave the dinghy slung in the horizontal position. Will the dinghy will be tilted up in a vertical position and create instability of the engine, especially in rough water, leading to it falling off and being damaged or lost. We suggest you consider all of these closely before deciding whether to leave your engine on when using the Dinghy Sling. Do not use with other gear or seating in dinghy that exceeds sling maximum weight rating, or is loose and could fall out. *Picture at top: Dinghy sling system attached to 26' power boat with a half swim platform holding a 9' inflatable boat. 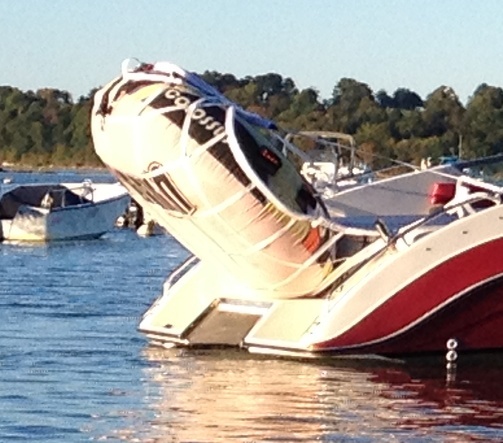 Boat was carried at speeds over 40 knots and has been through 4' waves.... with no problems! 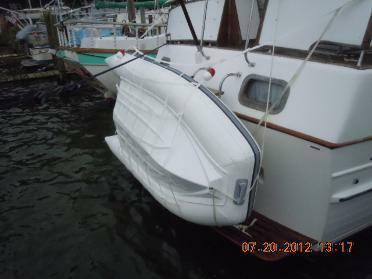 Below are several pictures showing actual use of the Dinghy Sling on a variety of customer's boats. Dinghy Sling deployed, ready to accept dinghy. The floats to keep sling out of props. Secure storage of dinghy on the swim platform. Dinghy rowed or motored over and secured onto sling and vessel using supplied straps. Mainship 30 with dinghy sling holding dinghy upright and secure. 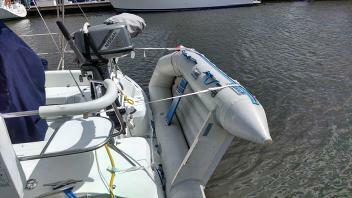 This inflatable boat is stable and secure... even in these 10’ seas! Special adjustable straps (supplied with sling) make it easy to lift your dinghy. 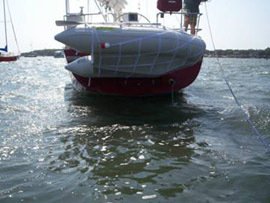 Rear view of Dinghy Sling system. Can be deployed in 30 sec. Dinghy sling used for carrying kayak on side of bow.Kayak secured in Dinghy Sling from bow rail and rests against rub rail. Even motoring through 3' waves did not move this. 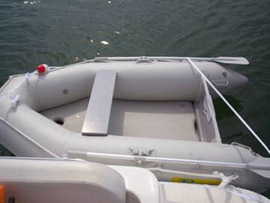 Secure the dinghy in the dinghy sling leaning up against the transom, railings, or similar part of the larger vessel. Secure the dinghy on an outward angle leaning out over the water so the sheer weight of the dinghy keeps it from flopping. Some people use the second method, but in very rough seas, they switch over to using the first method temporarily. The Dinghy Sling is easily operated with only 1 person.